Using Wild Ginger I thought the button down shirt project was difficult, that was a cake walk compared to the current jeans project. Those don't look quite right do they? It took me quite some time manipulating the numbers to get a draft that looked right on paper, then 15 muslins later I had a wearable pair pictured here at right. 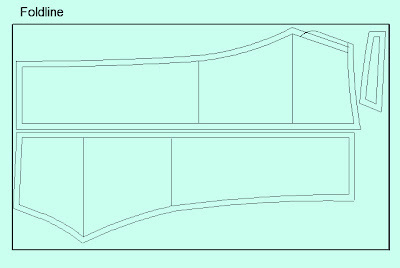 My next goal was to manipulate the side seam to create a perfectly straight line and have all the shaping done only in the inseam. This simply could not be done using the any of the standard setting in the Wild Ginger software and necessitated the learning of the pattern editor feature of the program. 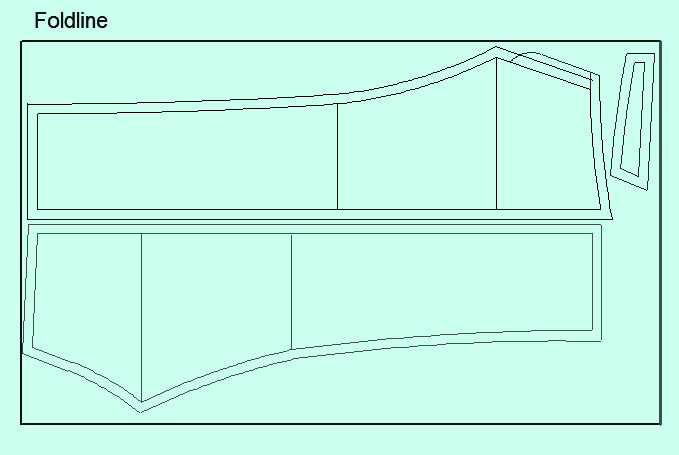 Why go through the trouble of changing the side seam? Three reasons really. First, almost all RTW jeans I've encountered have a straight outside leg seam. Likely for manufacturers it's a cost and time saving measure. If it saves them time and money maybe it will for me as well? Second, I wanted to see if the fit was altered by moving the seams out creating a less knock kneed look. I happen to be a little knock kneed and find jeans that taper from the hip and crotch toward the knee and ankle amplify that look. Third, I picked up some selvage denim in NYC, in order to create jeans that incorporate the selvage in the outside leg seam I need a perfectly straight seam to work with. 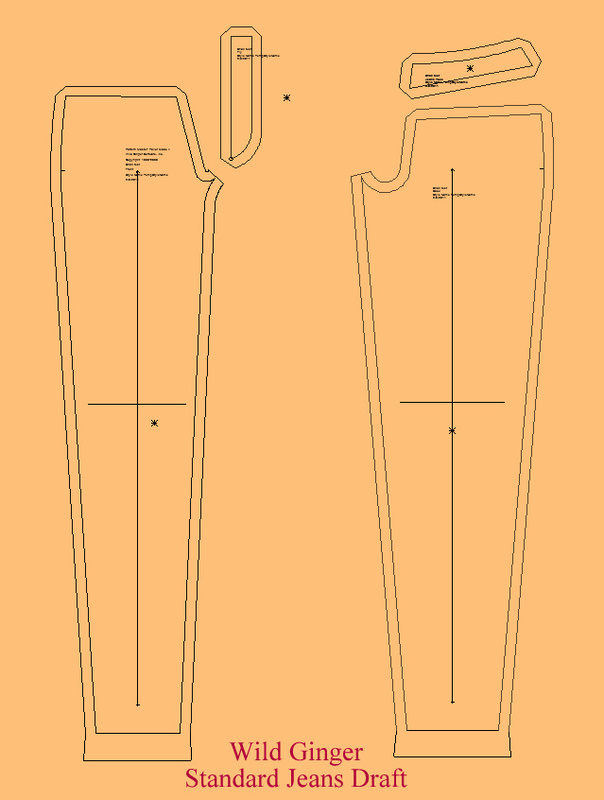 As a side note, I have never seen any sewing pattern for home use that utilized a straight outside leg seam. After cutting three pairs of jeans I can absolutely say it saves time and fabric. 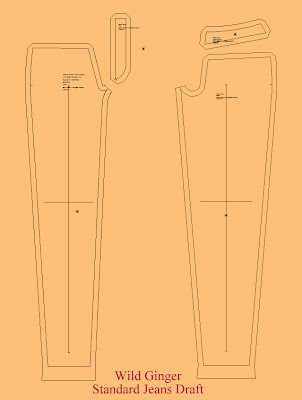 The straight seam allows you to place front and back leg along the same cut. I flipped one pattern piece so it was cut ankle to waist as you can see here shown on 60" wide denim. Most of what I use is closer to 72" wide so the flipping isn't really necessary. What's not shown is the waist, pockets, belt loops or facings. Here's my progression of patterns in my first attempts using the pattern editor features. The pattern editor for those who don't use Wild Ginger is a basic cad program that allows you to move lines and curves around the screen. It's really quite easy to use if you're willing to invest a few hours learning the software. #1 is the pair of jeans you see up on the right. #2 I straightened the leg seam but failed to reduce the crotch extension to compensate for the extra fabric in the hips I was creating. I also figured out how to move the fly extension to be cut on instead of a separate piece which is what I prefer. #3 I reduced crotch extension and also modified the yoke to avoid having a peak at the hips. The next pair I plan to make a little wider in the thigh and possibly straight leg from the knee down. I may also increase the center back seam length just a touch. All in all I'm really happy with the results. I did a video showing each pair of jeans, actually 4 in all. There was a first attempt that I didn't save the pattern from. They ended up being very very skinny in the legs. I picked up a wide format printer on craigslist for $100! It's an HP DesignJet from 1997 which seems really old right? This allows me to print my patterns without all the gluing together of letter size paper I was doing before. Saves me some good time and somehow feels very professional. I made a paper roll holder using PVC pipe. Both these machines live in the fabric room and I connect them using a 50' active USB cable. You can preview some of the projects at the picasa gallery but I'll be talking about them soon here as well. I'm very impressed with the task you have taken on and super impressed with the results. Great to see a post from you again. The jeans look perfect, I keep thinking about making jeans since I see so many fantastic ones on blogs - but it is so easy to just buy them! and to design your own pattern. whew! quite a feat but it paid off. I fantasise about the perfect jeans but had better improve my sewing a little more first.